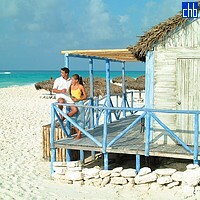 Hotel Sol Cayo Largo is the top property on Cayo Largo. The lovely aesthetic of pastel-toned Caribbean-style wooden structures with plantation rails is enhanced by thoughtful landscaping that makes clever use of the natural eroded limestone and foliage. The huge serpentine pool complex with water cascade is also a visual delight, and the broad deck is a great place to soak in the sun. Most of the 244 guest rooms are in two-level fourplexes widely dispersed amid the sand dunes 100 meters inland of the beach. 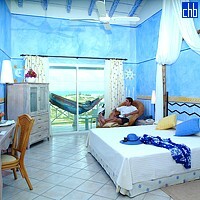 Decor plays up the maritime theme, with sponge-washed blue (or yellow) walls. Rooms have ceramic tile floors, air-conditioning, ceiling fans, a mix of rattan and faux-stressed antique reproduction furniture, plus TV, telephone, in-room safes, and spacious balconies with plastic seats and chairs. 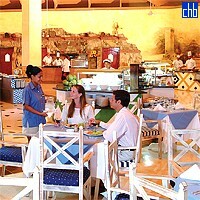 The three restaurants include an elegant gourmet dining room, plus a beachfront seafood grill. The poolside Sol Azul restaurant serves burgers and other snack food throughout the day. 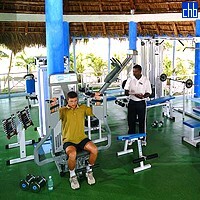 Sol Cayo Largo has a full range of watersports, including scuba diving. 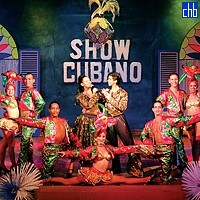 Nightly shows and other entertainment is offered, and is of a standard superior to that of Sol Pelícano. This is one "four-star" hotel that actually lives up to its billing. In the room the guests will have conditioned air, terrace or balcony, telephone, safe-deposit box, TV Satellite, connection to Internet, minibar, control of temperature, fits to 220 current v, dryer of hair, ceiling fan. The 8 Junior Suite rooms have air conditioned, telephone, safe-deposit box, TV satellite, Internet, minibar, iron and table to iron, fits of 220v, dryer of hair, coffee pot, mirror in the bath. Bed with canopy, sheets of flat, letter of pillows, CD-alarm clock, swings in the balcony, sea view, and room service in the breakfast.